SOD B® is released along the intestinal tract thanks to the gastric-protection provided by the coating. However, coatings only protect SOD from the digestive process and can’t help SOD to cross the intestinal barrier. As a protein, SOD has a high molecular weight and can’t be bioavailable and reach the blood circulation. 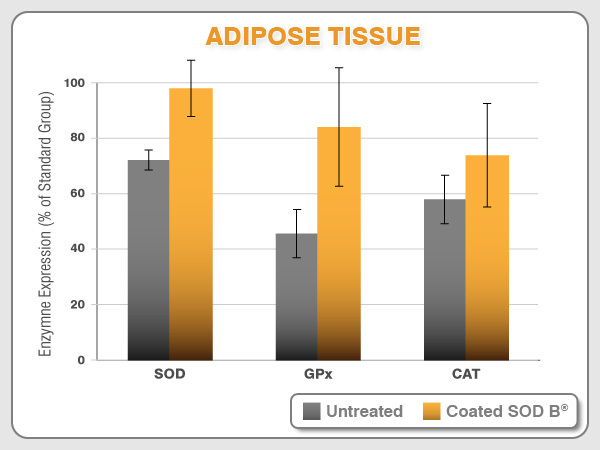 After 10 years of research, the Bionov research team have shown on several animal models and in different targeted tissues that an oral SOD B® supplementation induces the expression of the own body’s endogenous primary antioxidant defenses: SOD, CAT, and GPx. 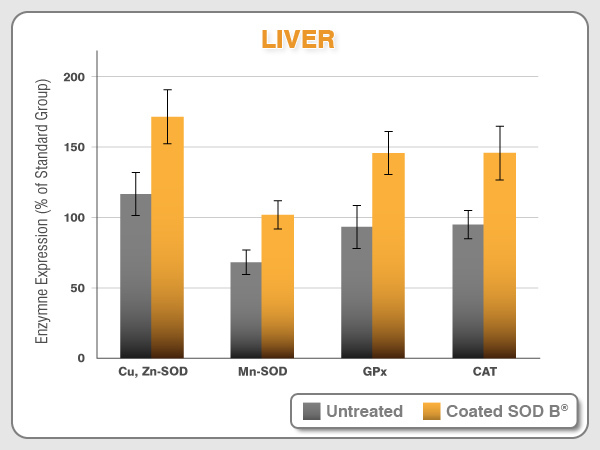 Major scientific publications performed by the Bionov research team have highlighted the SOD B® inductive pathway in several animals models on targeted tissues. 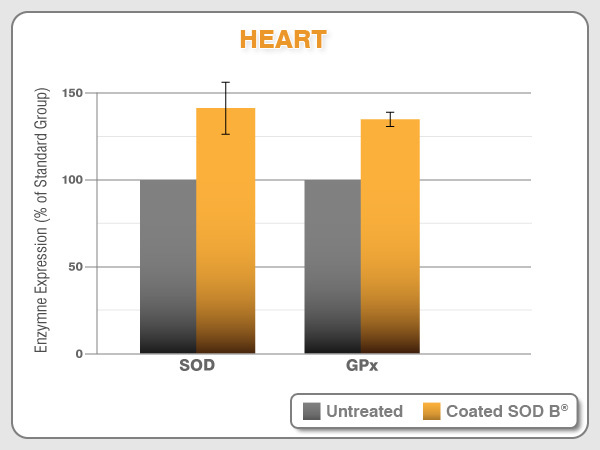 The stimulation of SOD, CAT and GPx expression allows a restoration of optimal levels of these key primary antioxidants, and the subsequent correction of oxidative stress and inflammation. 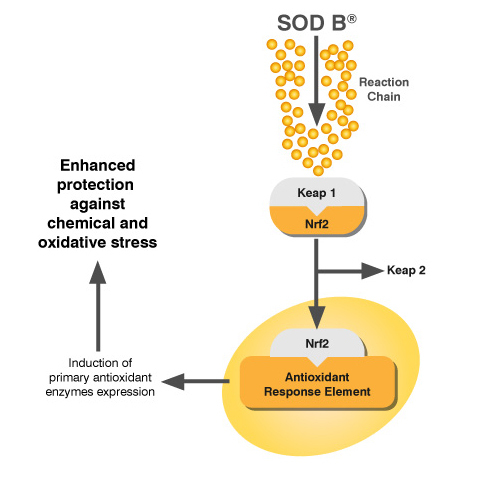 According to this mechanism of action, SOD B® leads to long-time health benefits by inducing a reserve of antioxidant enzymes, which can be recruited to prevent any physiological alteration. 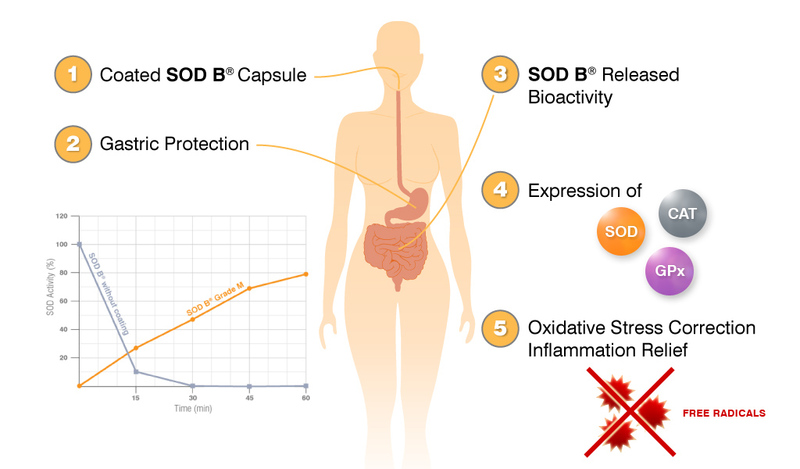 As discussed in a major published scientific review, once released along the intestinal tract, SOD B® could be able to promote the activation of the immune system and then induce a cascade leading to the activation of macrophages in the entire body. This immune response could induce endogenous antioxidant defenses, possibly via the upregulation of Nrf2/ARE pathway. Nuclear-factor-E2 related factor (Nrf2) is a transcription factor well known to induce antioxidant enzymes synthesis in the body.